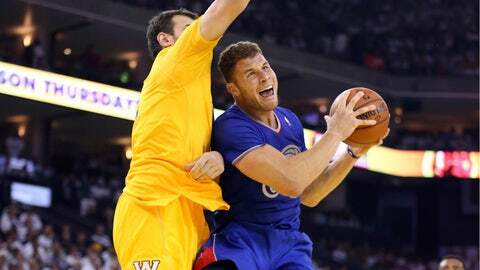 Blake Griffin was ejected for his second technical with 10:43 remaining after scuffling with Andrew Bogut. OAKLAND, Calif. (AP) — Klay Thompson blocked a shot by Chris Paul with 1 second left then contested Jamal Crawford’s 3-pointer that fell short at the final buzzer, and the Golden State Warriors held off the Los Angeles Clippers 105-103 in a feisty game that featured a pair of ejections on Wednesday night. Stephen Curry overcame a slow start to score six of his 15 points over the final 3:01 as Golden State snapped the Pacific Division-leading Clippers’ season-best five-game winning streak. Thompson finished with 23 points and David Lee had 23 points and 13 rebounds. Blake Griffin was ejected for his second technical with 10:43 remaining after scuffling with Andrew Bogut, following Golden State’s Draymond Green to the showers after they got into it at the end of the third. Green was tossed for a flagrant 2 foul. When the game ended, players tangled near the tunnel to the Clippers’ locker room and security personnel stepped in — and former Warriors swingman Stephen Jackson could be seen screaming in the middle of it all. It sure was feisty and festive from the opening tipoff at sold-out Oracle Arena, where fans wore "Christmas Whiteout" snowflake Warriors T-shirts for the holiday occasion. Neither Clippers coach Doc Rivers nor Warriors coach Mark Jackson is ready to deem this a California rivalry just yet — not until both teams are consistent contenders year after year, they say. It’s certainly getting heated enough to be close to such status. And they see each other twice more — next on Jan. 30. Golden State grabbed its first lead at the 10:35 mark in the third on Bogut’s running jumper and began the second half with an 11-6 spurt. The Warriors missed their initial six shots and fell behind 8-0, while Lee began 1 for 7 before a big second quarter got the Warriors back in it. The Warriors were 9 of 30 early in the second period and 2 of 7 from 3-point range but pulled within 49-45 on Curry’s 3-pointer with 3:16 before halftime, his first points of the game after missing his initial four shots. The Warriors were 22 for 52 in the first half — taking more shots than the Clippers’ 21 of 40 — but Lee’s dunk pulled Golden State within 53-51 at halftime. Notes: Former Warriors G Matt Barnes got some Christmas boos when he checked in for the Clippers midway through the first, while Antawn Jamison still gets his due respect. … The Warriors played their 23rd Christmas game and third in four years after having Christmas off for 26 years. They lost their previous Dec. 25 outing to the Clippers 105-86 at Oracle — Los Angeles’ last on Golden State’s home floor — to start the lockout-shortened 66-game 2011-12 season. … The Warriors are 10-4 at home and 4-0 vs. the Pacific Division. … The Warriors haven’t lost a season series to the Clippers since 2005-06. Golden State was one of only two teams along with the Thunder to take three of four from Los Angeles last season.